The real strength of Home Photo Studio ($39 Standard, $59 Deluxe; 30-use, feature-limited demo) is, oddly, not in its most basic functions. Like any photo editor of merit, it can adjust sharpness, color, contrast, brightness, and myriad other characteristics of any digital photo, either with a quick automatic-fix function or by providing the user with sliders for finer, manual controls. But I didn't find that the Auto Levels or Auto Contrast functions really improved photos all that much. In the end, I permitted the automatic cleanup to do its thing, and then I made more changes myself afterwards. Home Photo Studio includes frames in its special effects, which you can add and subtract until your photo has the right look. Being able to keep track of all the changes you made to a photo is a really useful feature, however. Home Photo Studio displays a "history" list of all the changes you made to any picture throughout the process of tweaking it. If you decide you don't like the last three changes you committed to, you can just select an earlier point in the history list and go back to a point in the process where you hadn't, perhaps, overdone a particular change. Having the history list put my mind at ease that I could take a lot of chances and not lose the ability to take a few steps back once I realize I've lost my way. Home Photo Studio's most fun features are the various effects and decorative borders you can apply to photos. You can also apply some bizarre artistic styling to photos: One in particular, the "Poking" effect (located in the Effects menu under Stylize), reproduces the outlines in digital photos into what looks like a copy burned into a piece of grainy wood. 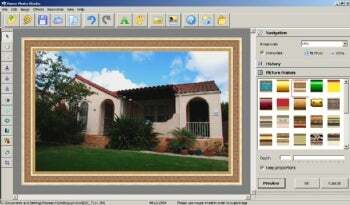 The trial version includes a small number of "framing" and greeting card templates in addition to some special effects and basic photo editing features, and paying for the $39 standard edition lifts the trial's 30-execution limit. Licensed users of the $59 deluxe edition get free access to a far greater supply of these designed borders and cards, as well as the ability to make photo collages and 3D compositions; use additional special effects; and import templates from Photoshop. Unfortunately, Home Photo Studio misses a few key steps. There's no shortcut key to "Save As..." and the program, by default, saves your changes over the top of your original photographs when you click the Save button. It also doesn't register itself so that it's the default program to open the image file formats it supports (GIF, JPEG, BMP, PNG, and TIFF), so double-clicking a JPEG image will open whatever other image editor or viewer you have installed on your PC.